A soldier wears a current M53 mask produced by Avon. CADILLAC, Mich.—Avon Protection Systems Inc. has won a $6.7 million contract from the U.S. Department of Defense to develop a modified version of its M53 protective face mask. There is the potential for follow-up production awards of up to $74 million once the modified system is developed successfully, the company said. Under the sole source pact, the U.S. manufacturing arm of Melksham, England-based Avon Rubber P.L.C. 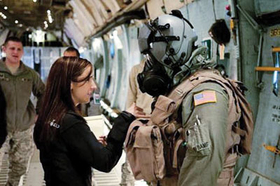 will develop a rubber chemical, biological, radiological and nuclear protective mask system, along with components, that provides respiratory protection for all U.S. air crews on military fixed-wing non-fast jets, which are non-pressurized aircraft, a company spokeswoman said. The contract includes a two-year preproduction phase that covers development, testing and user trials of the modified M53 mask system along with logistical support. The project, which was launched in early August, is expected to be finalized in 2017. "A number of masks will be produced for evaluation to take place, but this is only within the development stage," the spokeswoman said. Production is not covered by the $6.7 million agreement; that would fall under follow-up contracts. Development of the modified mask system will take place at Avon's Cadillac factory, where many of the firm's respiratory products are made, she said. Under terms of the contract, the system must provide continuous head, eye and respiratory protection against CBRN and other toxic industrial che-micals and materials, Avon said. An inspector reviews a test mask system. Other requirements include a system that operates in ambient conditions, providing uncontaminated breathing air to the user while in flight and during ground operations; integrates and interfaces with existing and emer-ging fixed wing platforms as well as joint air crew life support equipment, including communications; and integrates "with concurrent acquisition efforts to include but not limited to laser eye protection, night vision equipment, below the neck CBRN protective ensembles and new air crew flight equip¬ment," the firm said. 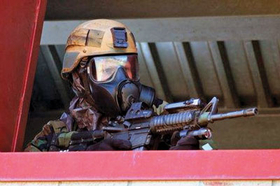 "We have built a solid reputation with the DOD, keeping war fighters safe with our M50 series JSGPM face mask system," according to Gary Dunn, vice president of the firm's business development and defense department programs for North America. He said the company takes pride in providing "outstanding quality, comfort and protection. Our record of delivery is why customers return." Avon's modified M53 mask system contract is its first with the U.S. Defense Department this year. Prior to 2013, it received several large awards from the agency, including two in late 2011 and another in early 2012. "Avon has gained a reputation as the respiratory provider of choice for the DOD, and we hope this solid relationship will continue as new requirements arise," the spokeswoman said. It also landed its largest non-defense department order, worth $19.3 million, for respiratory protection products, from an unnamed customer in the Middle East last year. Most of the revenue from that contract will accrue during the 2013 and 2014 financial years.